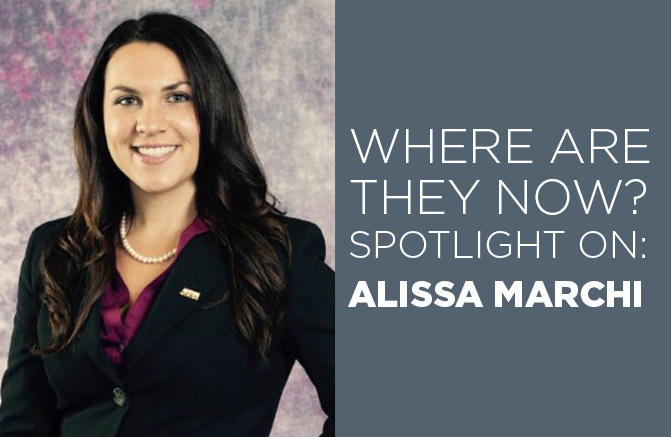 Alissa Marchi is a Senior Accounting Analyst in the Enterprise Accounting department with a focus in Hospital Accounting. She began her career as a Summer Associate in the Health Plan General Accounting and Financial Reporting department where she had exposure to both finance and accounting tasks. Marchi claims her favorite part of her first summer at UPMC was working with an awesome leadership team and having weekly meetings with Senior Management. This gave her the opportunity to learn about the other areas of Finance and Accounting within the company and eventually contributed to her seamless transition to the Enterprise Accounting department. After completing her summer as a Summer Associate, Marchi continued working part time in the Health Plan General Accounting and Financial Reporting department while finishing her degree in Accounting. Following graduation, Marchi began working at UPMC full time as a Financial Analyst for the Health Plan. Initially, her work load was comparable to when she was a Summer Associate, but over time she accepted additional tasks that were in line with her strengths. When asked how being a Summer Associate helped her excel as a full-time employee, Marchi said, “As a Summer Associate, I learned how important your ‘tool belt’ is and the value of networking. As a full time employee, the more tools I have in my tool belt the more opportunities to work with different areas of the organization arise, which expands my network and helps facilitate business.” Marchi is always open to adding things to her “tool belt.” Most recently she has been working with her leadership team to enhance her personal brand and build her mentoring and coaching networks. Marchi has now been working for UPMC for five years and says the best aspect of her job is the awesome people she works with. Her goals are to learn as much as possible, share her knowledge, and make a positive impact in future roles. For her outstanding performance, leadership, and dedication, Marchi received the UPMC ACES award last year. This honor is given to only one percent of UPMC staff from across the health system. When asked what advice she would give to current Summer Associates, Marchi recommends simply being yourself and viewing every experience as a positive one. She also added, “It’s never too early to start building connections that you may need in a future role.” Marchi wouldn’t change her career path in any way and has a bright future here at UPMC!